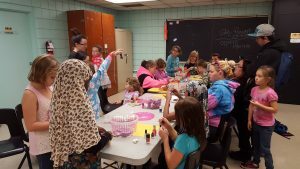 CORE Kids Spring Session Program! The 2019 Spring Session of CORE Kids After School Program will start April 15th, 2019 ending May 31st. We will be announcing a special end of the year celebration in June – keep watching! 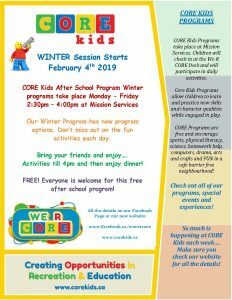 CORE Kids offers FREE after school programming! CORE Kids After School Program will operate out of Mission Services. The program operates Monday – Friday from 2:30-4:00pm. Everyone is welcome to participate. Check out the list of activities and programming for the Winter Session. 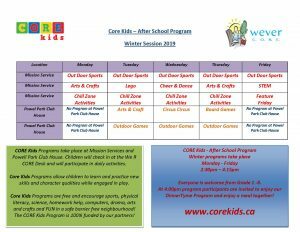 ** Note – CORE Kids After School Program Spring Session Activities will be posted soon. Some of your favorite ones plus a few new ones! Check back soon! The Core Kids Youth Achievers Program is a series of after school and summer activities where children in grades 7 & 8 have an opportunity to gain new skills and experiences —things that help children thrive and grow in mind and body. The programs provide practical leadership and skills building while promoting and encouraging ongoing learning and the importance of goal setting and post- secondary education and careers. Career Exploration: Career exploration and leadership program teach elementary school students about possible occupations and careers. Exploration days will introduce students to various careers through professional guest speakers, guest instructors and career exploration activities and excursions. Exploration days offer the soft-skills and workplace experience youth will need for the future. Career exploration days will provide students with a better understanding of their choices and career options and the education required to succeed. CORE Stores Experience: The economics and experience of operating a business. Youth participating in this activity will learn the skills involved in operating a venture. All aspects of operating a venture will be part of this hands-on-learning experience. Youth will assist in planning, set-up and operating CORE Store opportunities to provide planning, teamwork and retail skills. In addition to giving back to their local community. CORE Store experiences will include seasonal events that will provide participants with hands-on-experiences. 4:00pm End of Activities and Clean-up. Powell Park Club House – we will be using this space for various programs during CORE Kids Program time. Woodlands Park and Outdoors at Pinky Lewis Parkette – We will be using our great outdoor facilities for various activities, sports and games! Note – During the construction at Pinky Lewis Recreation Centre we will not be offering swimming or computers.